Plastic has improved our world in an impressive number of ways. For the last few decades it’s been steadily replacing more expensive or valuable materials for everyday tasks, and it’s making us safer and more energy efficient in the process! What’s more, it’s cost-effective and economical to produce (we at Excelsior like doing so with our preferred roto moulding process, incidentally). This week on the blog, we’re taking a quick overview of some of the core ways plastic has improved our world. One of the most important things that plastic manufacturing has done for the world, by far, is making things safer. A great example is the tamper-proof packaging in our shops and retailers, keeping consumers safe from things like knives and scissors. In a similar way, child-proof packaging keeps children safe from injuring themselves on sharp objects, or accidental poisoning by ingesting medication or chemicals. In fact, talking about medication is a great way to lead us onto our next point – plastics manufacturing has done fantastic things for the medical industry in particular. Amongst the benefits we mentioned above, plastic is a naturally poor home for germs and bacteria, which makes it inherently sterile. This is vital in environments like doctor’s rooms and hospitals. Another great thing about plastic is that our customers can specify products in bright, cheerful colours. This is about more than making them look nice – the bold colours of our safety steps, for example, make them easily visible even from a distance, making people less likely to trip over them. Meanwhile, their lighter weight means that even if people do happen to knock into them, they’re not nearly as hard on the shins as, say, wood or metal might be. Plastic has changed the transport industry drastically for the better; cars, trains and planes all now incorporate plastic into their construction. This change is most noticeable in cars in particular; plastics now make up about 10% of the average vehicle’s total weight, and over 50% of the volume. Steering wheels, stereos and door liners are all amongst the most common parts that are now made of plastic – as well as slightly less visible parts like engine components. All this reduced weight means that transportation vehicles (land, air and sea) all require less fuel to get around, which is not only great for the economy, but brilliant for the environment too. As well as the big-picture effects, plastic has changed our lives in lots of little ways too. When used in containers, it keeps fragile items safe easily due to its high durability. 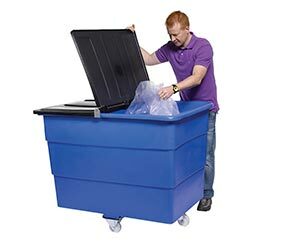 A useful example is our own materials handling products, which can take a bit of a pummelling while protecting the contents inside. You get this strength and safety at a fraction of the cost of other materials, too. Everyday tasks like moving things from one room to another used to be a much more arduous job. In decades gone by people would use wooden boxes or crates, which would then be stacked on top of each other when the job was finished. This not only took up space, but would make the entire thing prone to toppling over, posing a danger to anyone nearby. Today, though, we all often use stackable plastic boxes, which slot inside each other after use – it makes them not only safer, but far more convenient. And let’s not forget – plastic makes everything cheaper! Our own roto-moulding process means that you can make product batches in runs as small as ten products. This makes the products themselves cheaper, and as a bonus you’re not left with hundreds of unnecessary spares after the fact. At Excelsior, we’re firmly committed to helping you make your plastic product idea a reality. Find out how by checking out our case studies for success stories of previous customers, or just give one of our team a call on 0161 765 2010.